This outfit makes me feel like I'm on a tropical island about to take on some crazy adventures. Though I wish that really were the case, in reality, I'm just standing over here in front of this damn hedge. But that's besides the point. I hope you all are having a wonderful and adventurous summer! I honestly can't believe it's already July, I think we can all agree how quickly this year is flying by. 2015 needs to seriously calm down because it's starting to give me anxiety at how quickly time is going by. 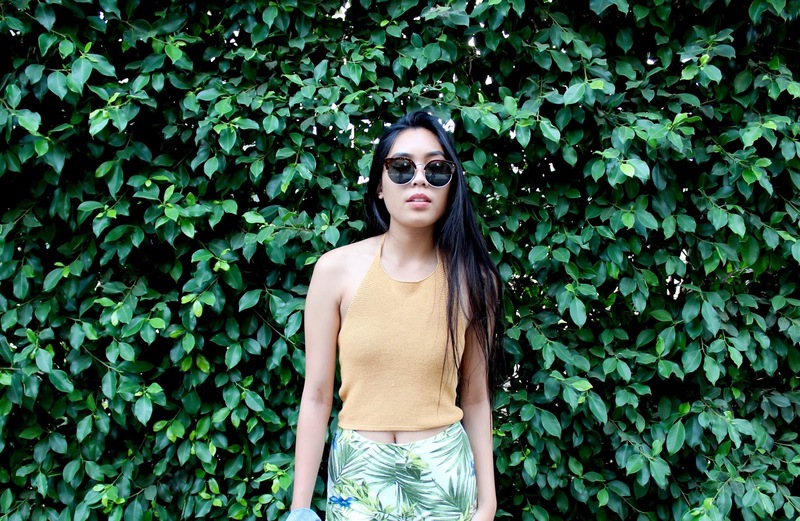 But anyways, here's my tropical vibes outfit featuring these beautiful sunnies from ZeroUV! I normally don't like how yellow clothes look on me, since for some reason it just enhances the yellow-ness in my skintone and makes me look sorta sickly. 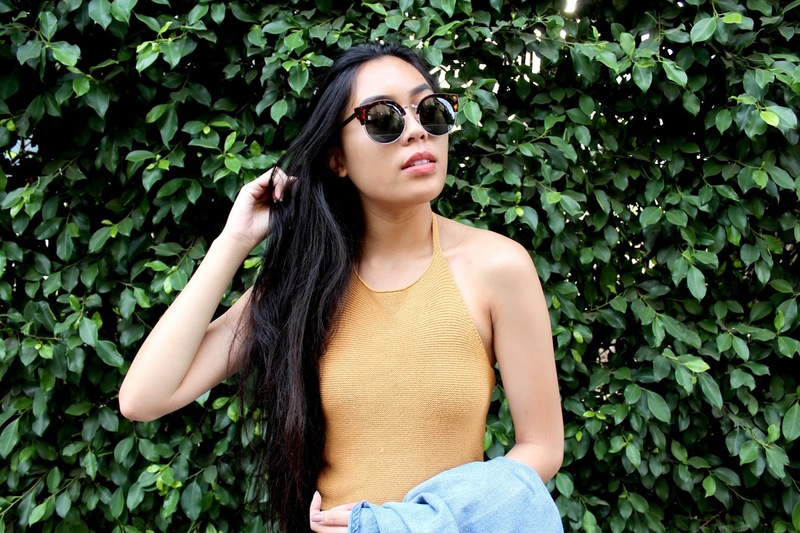 But surprisingly I'm really digging this mustard halter top from Brandy Melville. (Though in certain lighting, I'm pretty sure this color blends in with my skin tone and makes me look naked. But oh well?) I'm sure you guys have noticed, but I don't own much color in my wardrobe besides neutrals and different shades of blue... so I never really thought to pair these colors together. I do love the contrast of the mustard, green and blue; they give off a really interesting vibe! I must admit that I do feel very Brandy Melville-esque in this outfit though. So I mean, of course I had to finish the outfit with some high top converse. To balance out the plain colored top, I chose these super fun tropical shorts from Forever 21. The shorts are by far my favorite part of this outfit. For one, they're comfy AF, that it doesn't even feel like I'm wearing anything. Haha okay, as weird as that sounds, we can all agree that no one wants to wear heavy clothes during the summer! I bought these shorts probably a year ago, but I'm sure you can find a very similar pair at Brandy Melville. I'm also holding this denim button up just to give it a more casual feel. 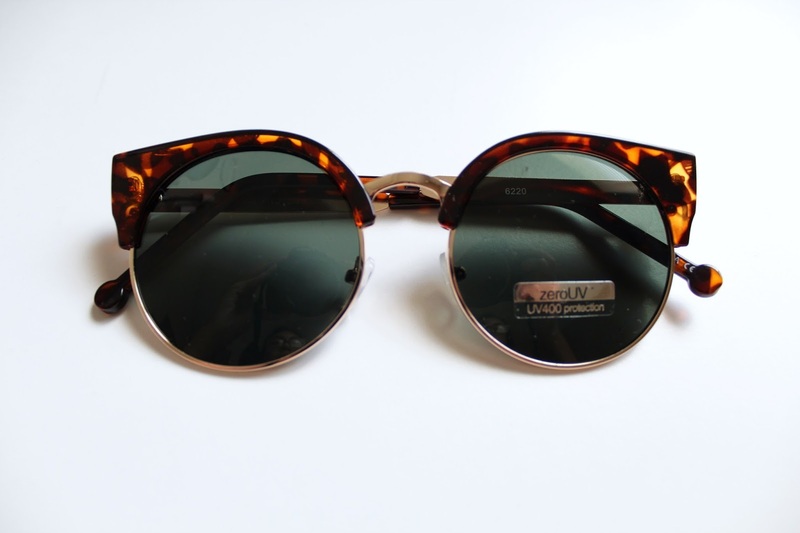 Today's outfit features these classic sunnies from ZeroUV! The style number of these are #9494, in the tortoise with green lens. But they also have other available colors on their site. And if you're not feeling these, don't worry because they have SO MANY styles to choose from. You're bound to find something you like!